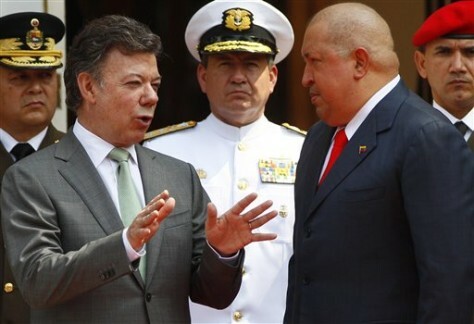 Colombia's President Juan Manuel Santos, left, speaks with Venezuela's President Hugo Chavez upon Santos' arrival to Miraflores presidential palace in Caracas, Venezuela, on Monday. Colombian authorities say one of the country's most-wanted drug traffickers has been captured in Venezuela. The U.S. government had offered a $5 million reward for information leading to the arrest of Maximiliano Bonilla Orozco, who is best known by his alias "Valenciano."